One of the fun things about creating websites is that I get to see new ventures as they are being created. One of my favorite new things is a brand new MakerSpace coming to Lacey, WA. 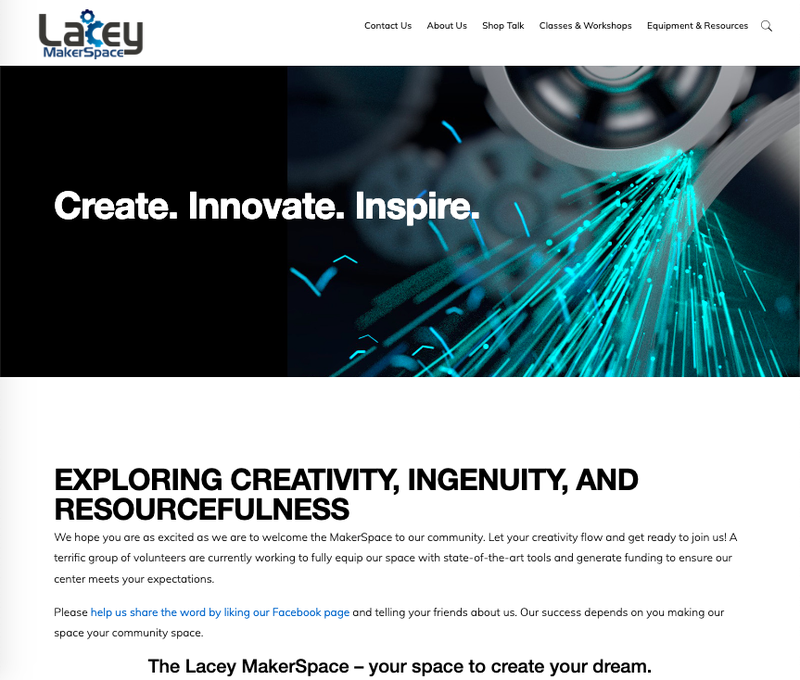 Several months ago, I was brought on board to create a website for the new Lacey MakerSpace. This is no ordinary MakerSpace; this one is built in partnership with Saint Martin’s University, the City of Lacey, and the Thurston Economic Development Council. This kind of community partnership will give this MakerSpace access to resources and tools the average MakerSpace doesn’t have. Every website should serve a purpose. Part of my job is to help the organization get clear on their purpose and then help guide them in how to present that purpose. This was no exception. Many of the projects I take on already have a graphic designer who has created logos, so the graphic design work we do must match the design already done. Fortunately, Lacey MakerSpace used DZines Creative Solutions and Graphic Designs. They provided me with a branding guide complete with logos in multiple file formats, fonts used, color requirements in multiple formats, all in one handy document. Everything I needed in a couple of pages rather than a hodge podge of files and emails. They even had a logo file that was perfect for creating the favicon for the site! Can I just go on the record and say that the logo is gorgeous and really captures the essence of the project? Using the client’s message, we created content that would keep the community updated on the progress of project, solicit donations and give people a means to volunteer. As a startup nonprofit, their budget was limited, so I chose to start with a Genesis child theme and customize it to match their branding. Using Genesis and a child theme is a practical way to create a beautiful, functional and robust website on a budget. I’ve used Genesis for years so I can customize the child themes quickly and Genesis has many accessibility features integrated into it. This makes meeting WCAG 2.0 Level AA easier. The space allocated for the logo needed to be changed so I adjusted some font sizes and colors to match the branding guidelines. I activated the accessibility features and made the title of the home page visible to screen readers. Using a contact form plugin, community members could sign up to volunteer when the space was open. Mailchimp signup forms were included to enable the team to send out status updates and news to people on the email list. As the project has gotten closer to launch, more people have signed up to the email list and have volunteered. The community is getting very excited about the Lacey MakerSpace. Part of every project includes training the client to use the website, especially the blogging functions. I spent time training the executive committee members on how to use WordPress. As a result, the executive committee has been posting regular updates to the blog with posts on the progress of the building, community events where they have participated, and more. 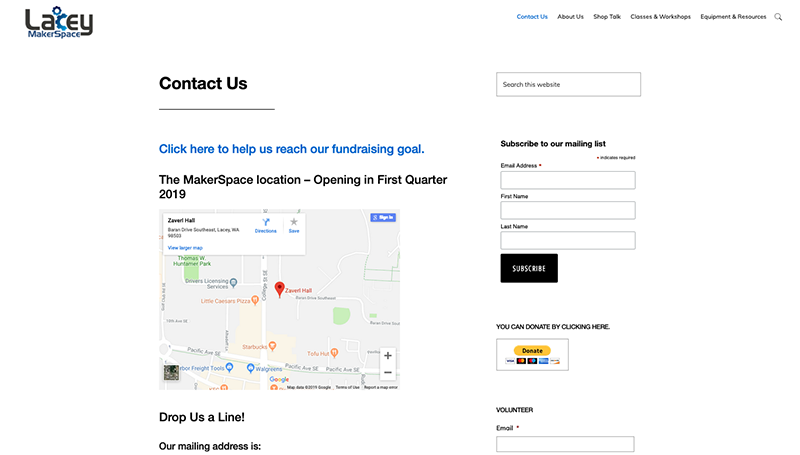 As the opening date for the Lacey MakerSpace approaches, we’ll be adding an event calendar to the website. This will allow them to list classes, seminars, and community events in a way that is easy to use.